At Firthmoor Primary School, we aim to ensure that our pupils can confidently and competently apply basic number facts and calculation methods in solving mathematical problems across the curriculum. Maths lessons starts with a ten minute ‘Rapid Maths’ activity to practise and reinforce key mathematical skills. Lesson objectives are drawn from the National Curriculum framework with opportunities to cover all aspects of fluency, reasoning and problem solving. Children have access to a wide range of practical resources including number lines/squares, dienes and Numicon equipment. Interactive whiteboards, laptops and ipads allow children to experience a variety of online learning resources. Wherever possible, staff present pupils with a ‘real life’ context for learning. Extra support and challenge is provided through 1:1 and small group intervention sessions. Y5/6 pupils are able to attend Mathsletic booster sessions in the Computing Suite before school each morning whilst invited pupils from Y1 to Y6 work 1:1 with an adult at an after-school Maths Club every Tuesday. Children are assessed on times table knowledge, arithmetic and reasoning skills on a half-termly basis. Older pupils participate in the annual UK Primary Maths Challenge with the school celebrating a number of medal winning successes in previous years. 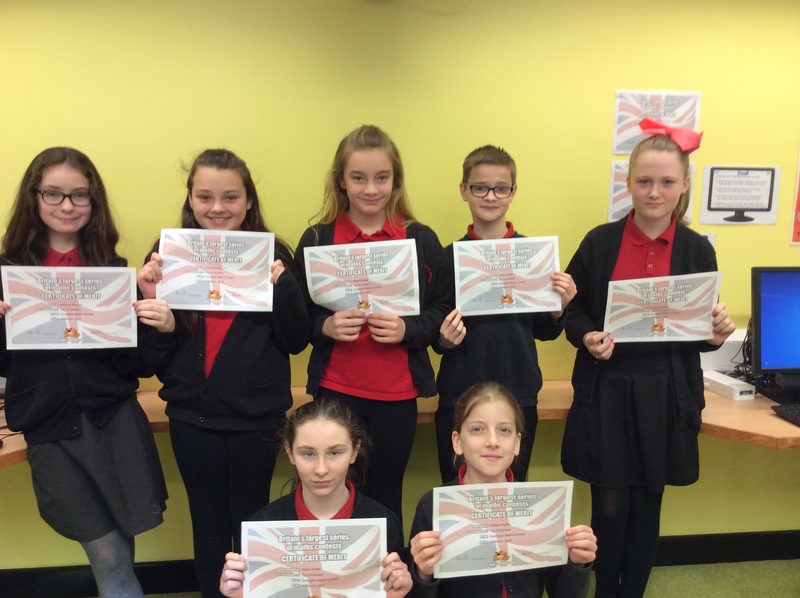 Below is a photograph of some Year 6 children who have been taking part in SumDog, an online Mathematics challenge which helps increase speed, accuracy and motivation in Maths. The children ranked top once again. Well done Year 6’s.